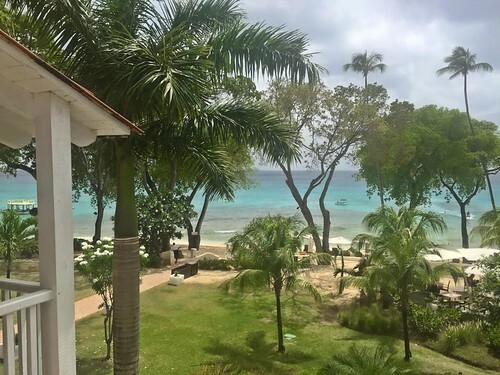 BARBADOS has everything tourists demand of a tropical paradise – powdery beaches, turquoise ocean, friendly locals and a haven of colourful marine life. The low-lying west coast shimmers with star-studded beaches and the south coast has a thriving nightlife with a range of all-inclusive resorts suitable for families. While the island’s natural beauty has been attracting sun-seekers for decades, there is also plenty of history for visitors to uncover from the UNESCO World Heritage capital, Bridgetown, Sunbury Plantation House, or a rare Jacobean mansion at St. Nicholas Abbey. Barbados was under British dominion from the time of its settlement in 1627 until its independence in 1966 and in the early years, sugar cane, farmed by slaves brought over from Africa, made the island the richest of all Britain’s colonies in the New World. The slaves were freed in 1834, and gradually their descendants – 90 percent of the population – have taken over the political reins. Though independent, Barbados embraces its British Empire roots. Afternoon tea remains a tradition, cricket is the national sport, and many Bajans speak with a British accent. The past is alive everywhere, including 18th- and 19th-century homes scattered around the island. For a glimpse of pre-plantation Barbados, visit Welchman Hall Gully . The Barbados National Trust owns this lush tropical garden, which contains specimens of plants that were here before the English settlers landed in 1627 and later imports that include cocoa bushes, and trees from which both cloves and nutmeg are produced. Occasionally, you’ll spot a wild monkey amid the flora. You can also see breadfruit trees that are supposedly descendants of the seedlings brought ashore by Captain Bligh, of Bounty fame. At the most elaborate of the island’s tourist sites is Harrison’s Cave. This stream cave system – first documented in 1795 but not excavated until the 1970s – meanders for a mile through the coral limestone rock on which Barbados is built. A solar-powered tram takes you through tunnels and caverns, rolling slowly among limestone stalactites and stalagmites glowing in red and green lights, stopping for closer inspection of the pools, streams, cascades and waterfalls. Highlights include the Great Hall, a huge cave decorated with some quite spectacular stalactites and stalagmites, and the Rotunda Room, with its creamy-coloured formations. Seafood, like snapper, shellfish, and the popular national emblem, the flying fish, is on every menu, from five-star restaurants to beachside cafes. It’s usually served with spicy cou-cou (cornmeal and okra), but pudding ‘n souse (pickled pork, breadfruit, and sweet potato pudding) and macaroni pie are local specialties worth trying, too. 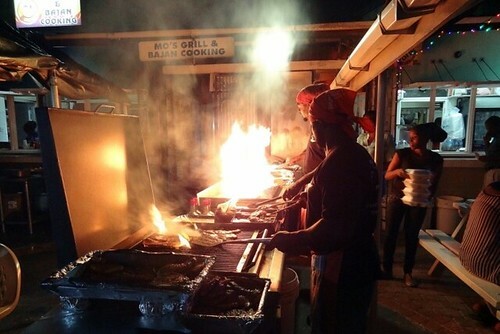 For a taste of how the locals like to party, head to Oistins where the fish market plies its trade into the night and comes alive with stalls providing fresh grilled fish, rum and live reggae to add to the entertainment. On the Speightstown waterfront, the Fisherman’s Pub is a local institution that serves up fish from the boats floating off the back deck, with steel-pan music on Wednesdays. Try the national dish of cou-cou (cornmeal and okra) and flying fish. The popular Roundhouse Restaurant overlooks the world-famous reef break known as Soup Bowl. There’s banana bread at breakfast, sandwiches and salads at lunch, and specials such as breadfruit soup at dinner. Surf spots such as Soup Bowl on the east coast have put Barbados on the map as a world class surfing destination, but you don’t need Kelly Slater’s skills to catch some Caribbean waves. For beginners lessons, starting at about £40 for two hours, the three main surf schools are Zed’s Surfing Adventures (Surfer’s Point, Inch Marlow; 00 1 246 428 7873;barbadossurf.com), Burkie’s Surf School (108 Plover Court, Long Beach, Christ Church; 00 1 246 230 2456; surfbarbados.net) and Barbados Surf Trips (00 1 246 262 1099; surfbarbados.com). Nestled on a stunning stretch of white sandy beach where sea turtles return to lay their eggs year after year, the Turtle Beach Resort by Elegant Hotels is a luxurious all-inclusive hotel with an environment that is friendly to both families and couples. The south coast location is peaceful, but just a few minutes away from St Lawrence Gap, a vibrant hub consisting of famous dining spots and unforgettable night life experiences. The resort is entirely made up of spacious attractive suites with a private balcony or patio looking out over the pristine gardens, breathtaking ocean and sparkling pools. Clean lines and tiled flooring keep rooms light and airy with soft green and cream tones providing a layer of tropical warmth which blend with the lush greenery of the open-air common areas. All rooms have a sofa bed, flat-panel TV, mini-refrigerator and iPod docking station with one-bedroom suites offering a separate bedroom and living room. There are three restaurants to choose from, including a beachside waterfront restaurant and an adults-only option, Asiago’s which serves authentic Italian cuisine in a semi-formal atmosphere. Buffet breakfasts are extensive, and most premium-brand drinks are covered under the all-inclusive terms. If you want a change of scene, you can dine at Elegant Hotels’ other all-inclusive, Crystal Cove, at no extra charge on the West Coast. The activities programme and facilities provide a range of options for all ages from mixology lessons to snorkelling, with a supervised kids’ club for children aged 3-12 and evening entertainment in the form of dance shows and live music. There’s also a games area with table tennis, table football and a pool table and a spa offering a range of indulgent treatments. With its white-washed buildings and glorious landscaped gardens, the recently refurbished Tamarind by Elegant offers chic understated luxury in a premium West Coast location. Set on a 750-foot crescent of powder white sand, Tamarind’s 104 newly renovated guest rooms and suites offer vibrant, modern décor with a fusion of Mediterranean influence and Caribbean style including spacious floor plans, oversized balconies and panoramic ocean views. The Sugar Cane restaurant offers open-air dining for breakfast and afternoon tea, Rilaks Deck by the main pool is a South Beach-inspired restaurant with innovative tapas and cocktails and signature restaurant, 246, offers a range of international fine dining options with a spectacular beach backdrop and live poolside music on select evening. The hotel group also owns exclusive Daphne’s next door – sister of the famous South Kensington restaurant – serving a blend of Bajan and Italian cuisine. For those who love to make eating fun, there is also the Sunday Beach Party featuring a grill station, steel pan music, local cuisine and a mini beach bar for the adults. Complimentary water sports include snorkelling, sailing, boogie boards, kayaking, windsurfing, banana boats, Hobie Cat, and water-skiing. A water taxi service also runs three times a day between Tamarind and Elegant’s three other west coast hotels: Crystal Cove, The House and Colony Club or if you want to go further afield, the hotel sits about halfway up the coast, so nowhere is much further than half an hour away by car. The Royal Westmorland, an 18 hole Robert Trent Jones designed course, is nearby for keen golfers. The concierge team are also very helpful in putting together personalised family friendly itineraries. 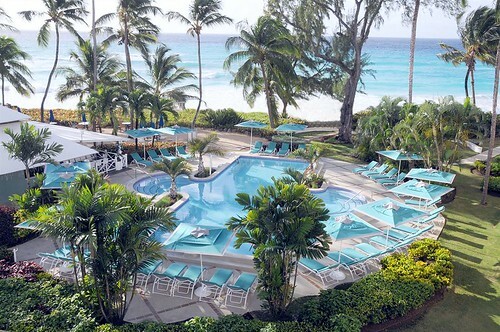 From adventures such as swimming with turtles, to educational marine programmes and golf lessons, there are plenty of ways to have fun on a family holiday in Barbados. BA and Virgin Atlantic fly to Barbados from several UK airports. Fares start from around £650 return.